Swimmers and boats that come to visit wild spinner dolphins close to shore during the day could be disturbing their rest and potentially harming them. Wild spinner dolphins feed off-shore at night and return to sheltered bays and coastlines during the day to rest, socialize, tend to their young, and avoid predators. Any energy used towards responding to human activity--even if they appear to just be curious and enjoy the interaction--is energy not being used for these behaviors that are critical for survival. When their rest is interrupted, especially if it happens many times in a day, it can affect their health and well-being. 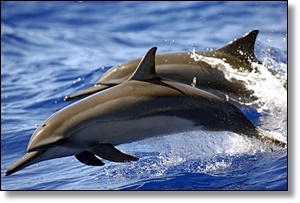 Swimming with resting spinner dolphins may constitute "harassment" under the Marine Mammal Protection Act. Any act of pursuit, torment, or annoyance that has the potential to disrupt a marine mammal's behavior is "harassment" under this Act and is, therefore, against the law.